On Friday, after a 4.30am start and a ridiculous delay (thanks for nothing Flybe) I finally arrived at Gatwick - 3 hours behind schedule. But a short train journey later, I was in the company of my good friend Joanna and we spent a lovely afternoon in Hastings Old Town to help me forget the nightmare journey! My new Damart coat had its first outing on the trip. Yes, you read that right - Damart - that thermal company that your mum/granny used to get a catalogue from. But never fear, Damart, while still retaining its core business in thermals and mature fashion has created an amazing look book to show that some of the clothes they sell can be worn by women of all ages. And it really was a great look book - I honestly was spoiled for choice but kept coming back to this great checked coat. If you scroll down, I've shared some other look book images so you can see what I mean. Unfortunately, the coat is sold out but I've seen it younger bloggers on Instagram and Pinterest a few times in the past month so I think it's become very popular all of a sudden! Footwear was the main concern this weekend as I've done London before with the wrong shoes and was determined not to make that mistake again. So I opted for my Seven Boot Lane ankle boots as they have the perfect heel height and are super comfortable. And I can report back that they were amazing when worn for 12 hours a day for 3 days in a row! If you find yourself in Hastings, I really recommend a visit. 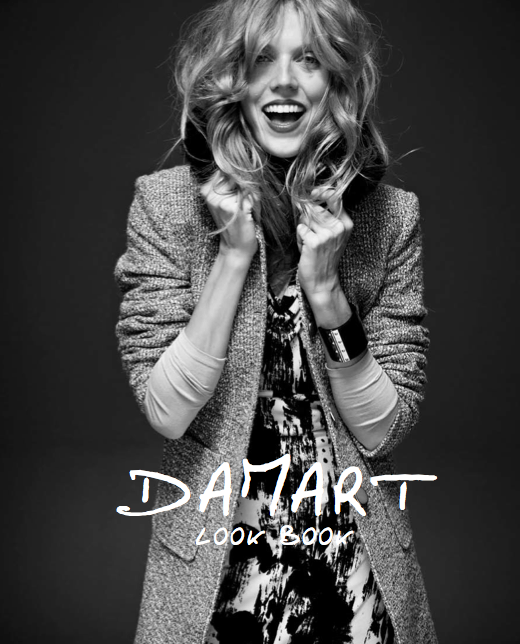 I'll leave you with a few of the photos that impressed me so much from the Damart Look book. Not really what I was expecting either! Check out the whole range on this link and if you're on Pinterest, there's a great board on this link with lots of younger bloggers wearing the range. Gorgeous coat Avril, can't believe it's Damart & I'm loving the pattern of that last skirt too! That Damart coat looks fab on you Avril and I think I would like that quirky little shop a lot too:) Looking forward to part two! Love the look of Hastings old town.....what a pretty little place, would love to visit it! Everything looks so fun and fabulous. Cannot wait for next year! Great coat, who would have expected it from Damart?! Very lovely. Ooh, Butlers Emporium looks lovely. Love shops like that. And your coat? Wow! It looks brilliant on you. Super stylish.